As many people have said in the past, Benefit cosmetics can be a little on the pricey side, which is one of the reasons why I only have a few of their items. Another reason is there is so much of it and although all the names of the products are quite cute, I have a hard time actually knowing what any of them do. Imagine if there was a company that took the best ideas from Benefit and made them their own. Too good to be true? How about if they sold those items for a fraction of the price of Benefit? You think I'm pulling your leg. Well I'm not. Me Me Me have been taking influence from Benefit for a while now with such items as Moon Beam etc but now they have added another item to their list... Blush Me!. 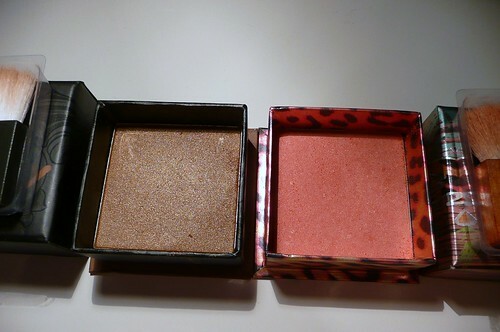 On the left is one of the brand new Blush Me! 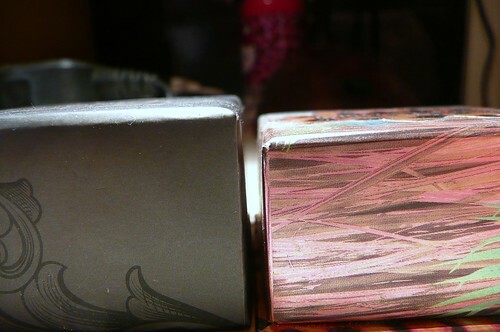 and on the right is Benefit's Coralista. As you can see the boxes are very similar. Me Me Me have certainly gone to town with the packaging. If it didn't say Me Me Me on it you'd think it was by Benefit. The only obvious differences that I can see between the two items are the fact that the Me Me Me box is slightly taller than the Benefit one and the Me Me Me one has a mirror on the inside. One up to Me Me Me! And then we move onto the brushes that are included. Me Me Me actually took the time to brand their blush and it is notably softer than the Benefit brush. Two up to Me Me Me! And finally we move onto the product itself. It's hard to compare these two because they are such different colours, but Coralista has always been one of my favourite blushes. I love the texture and how it looks on the skin. The Me Me Me Blush Me! Bronze really looks nice on me as a blush instead of a bronzer, but you need to be very careful with it. In all honesty the forumulas do seem fairly similar. I do love both products, but the saving that you make on the Me Me Me Blush Me and the time that they take on making the product their own really puts it ahead for me. Thumbs up to Me Me Me! Me Me Me definitley knows what they are doing. Benefit should watchout! I can't believe how good the Me Me Me blushes are for the money. It just goes to show that Benefit rip people off left right and centre. i have walked past the Me Me Me display a million times without even glancing at it, but i'll definitely be taking a closer look - asap. Good comparison! 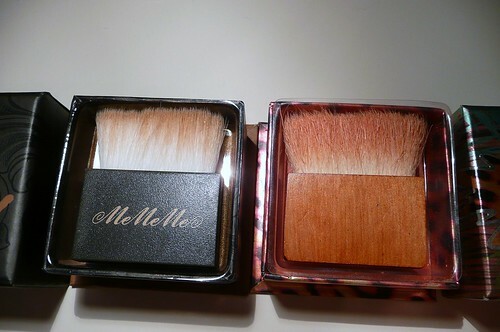 The Me Me Me one definitely looks as good as the Benefit one! I've always loved the Benefits products, mainly because of the cute packaging and fun names...but I've never actually been able to afford spending over £20 on a mascara! 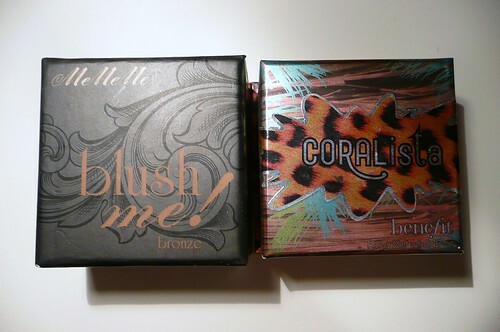 I prefer the Me Me Me packaging of the blusher to the Benefit one, do you? I'll definitely take a look at their products now, like Laura I too have just walked past and not really taken any notice of them before, but I will now!